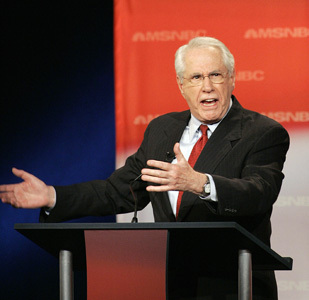 The star of last week’s Democratic presidential debate was a fringe contender Mike Gravel, 77, a former Alaska senator, who became a blogosphere sensation for saying that it should be a felony for Dubya & Co. to stay in Iraq. (He also drew laughs when he said the leading candidates scare him because they won’t rule out bombing Iran. “Who are we planning to nuke?” he asked Barack Obama. “I’m not planning to nuke anybody right now, Mike,” responded the Illinois senator.) Gravel — it’s pronounced gra-VELL — is a Columbia alum who drove a New York City cab while a student, and he’s back in town for appearances on The Colbert Report tonight and the Today show tomorrow morning. We spoke to him before he left his Virginia apartment, which doubles as his campaign headquarters — and we hope Colbert’s interview goes better than ours did. So what was it like driving a taxi in 1950? Once I picked up Walter Winchell at the Ritz at 2 a.m. He’d been at a card game with some detectives, getting his information. He was funny, but he was sober. I also once drove Jim Farley, who was FDR’s campaign manager. How did being a cabbie equip you to be president? It taught me that people have both good and bad in them, and that with the proper leadership, you can draw upon what’s good, unlike our president, who’s only brought out the bad. Do you agree with the current taxi lobby that pedicabs in New York City should be limited in number? I really can’t comment on that intelligently. As president, when I don’t know the details of an issue, I’ll tell you. You want to replace the income tax with a progressive sales tax and allow citizens to bypass elected officials in enacting laws. Are you worried that, at last week’s debates, you were just entertainment? Most pundits, even you, don’t understand what the hell I’m talking about. I want you to share power with me and Congress. You singled out Hillary, Obama, and Edwards last week as frightening you. What would you say to Hillary alone in an elevator? I’d say, “You’re a decent person, but you’re not qualified to be president.” What else am I going to tell her? “Oh, I like your hairdo”? Give me a break. Why did you ask him alone whom he’s planning to nuke? I did not single him out. Yes, you did. I watched the video three times. Oh, please. Watch it again. He said that everything is on the table with respect to Iran, which is code for nukes. That’s why I went at him. Do you think Dennis Kucinich is angry you’re stealing his thunder as the left-wing fringe candidate?